On Thursday, March 3, 2016, the Auschwitz Institute for Peace and Reconciliation (AIPR) launched the Training Resource Manual for Genocide and Mass Atrocity Prevention in the Great Lakes Region of Africa (also available in French) at the offices of White & Case LLP. Designed to provide guidance and insight into the nature and practice of prevention, the Training Resource Manual for Genocide and Mass Atrocity Prevention in the Great Lakes Region of Africa contains a collection of existing resources that regional and national mechanisms can learn from and use as reference material to gain insight into the nature and practice of prevention. Comprised of 6 primary chapters, the online publication provides a range of resources covering a diverse set of topics such as the roles of the state and civil society in prevention, instruments of early warning, and transitional justice, as well as thematic areas such as the prevention of electoral and resource scarcity related violence. The Training Resource Manual was created in response to the findings of a baseline analysis that assessed the existing capacity in the Great Lakes Region to prevent genocide and other mass atrocities. This allowed for the contents of the Manual to directly address the areas of greatest need, as identified by local actors. AIPR’s Africa Programs New York Liaison, Jack Mayerhofer, opened the launch event by giving an introduction to the work of the Auschwitz Institute, speaking specifically about the work of AIPR’s Africa Programs and the development of the Training Resource Manual. Following Mr. Mayerhofer was Owen Pell, a member of AIPR’s Board of Directors and Partner at White & Case LLP. 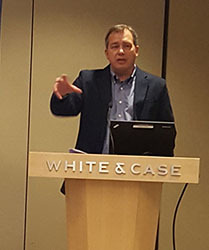 Mr. Pell commented on the links that exist between the background research and analysis required to produce the Training Resource Manual and the work of White & Case. He indicated that White & Case should itself be viewed as a resource to those in the field of prevention. Mr. Pell also discussed the value of the Training Resource Manual from his perspective. He highlighted the publication’s comprehensive nature, as is evidenced by the expansive table of contents. AIPR’s Academic Programs Director and author of the Training Resource Manual’s foreword, Dr. James Waller, spoke next. He discussed the Manual and its importance within the broader continuum of prevention and the necessity of viewing prevention efforts as a collective responsibility to be undertaken by all. To illustrate this point, he cited Primo Levi’s declaration on the potential for the repetition of mass atrocities and the importance of preventive measures. 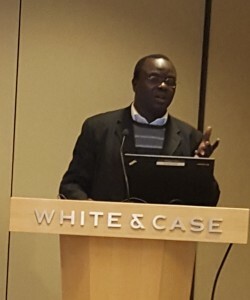 Dr. Waller highlighted the similarity of Levi’s words to those uttered decades later by the United Nation’s Special Adviser on the Prevention of Genocide, Adama Dieng, who asserted in 2014 that while no society can be considered immune to the risk of genocide, all countries in all parts of the world share a collective duty to prevent future violence. Dr. Waller explained that the Resource Training Manual represents a crucial step in strengthening and advancing this shared responsibility. AIPR’s Africa Programs Director, Dr. Ashad Sentongo, who oversaw the development of the Training Resource Manual, concluded the program. He walked the audience through the layout and contents of the Manual, demonstrating how to best access the information within. Dr. Sentongo also discussed the necessity for the existence of a tool like the Training Resource Manual. He explained that the Manual allows for sustained programs of training and makes essential reference materials available not only to National Committees for Genocide Prevention, but to all regional actors in the field of mass atrocity prevention. The Training Resource Manual for Genocide and Mass Atrocity Prevention in the Great Lakes Region of Africa is available in English here and in French here. The Auschwitz Institute will be continually updating the Manual in order to provide users with the most relevant and up-to-date resources. We look forward to hearing from everyone who has used the Manual and strongly encourage users to send questions, feedback, and other comments to Jack Mayerhofer, AIPR’s Africa Programs New York Liaison, at jack.mayerhofer@auschwitzinstitute.org.